Welcome to our 5-minute review of the best cheap inflatable SUP for beginners. If you’ve already started investigating inflatable paddle boards you’ll have noticed one thing…they’re expensive! 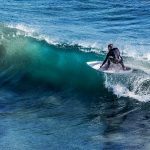 We’ve searched online reviews, Reddit, forums and more to determine the best cheap inflatable SUP for beginner boarders. How Much Should A SUP Cost For Beginners? If you’re like me, you don’t want to burn dollars for every new sport you try. Dip your feet in at the shallow end first with a mid-range setup, and then invest in something better when your skill level outperforms your beginner setup. That’s certainly what I’d suggest here. The cost of a premium 2019 SUP setup will sit in the $500-$1,100 range. That’s a lot of bills to be burning on a sport you’ve never tried. On the flip-side, there are half a dozen cheap inflatable SUP setups under $300, so that’s where we’ll be focusing our attention. We’re not going to make this more confusing than it already is. We know there are a dozen or more cheap SUPs suitable for beginners on the market. Well, we’ve got a great option for you that’s an exceptional all-rounder. 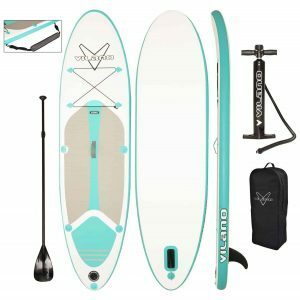 After checking online SUP reviews, prices, features, and a range of package deals – the Vilano looks like the best inflatable paddle board as a beginner setup. Who Is The Vilano SUP Suitable For? 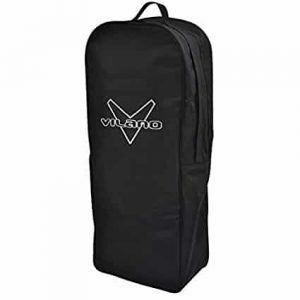 Vilano have obviously made sure to not just make one of the best cheap SUPs on the market, but one that can be used for a range of adventures. It’s designed for adventure seekers that want to use their paddle-board on calm oceans, lakes, rough surf – an all-round paddle board that offers excellent value for money. When I’m looking for something new, I jump straight over to Reddit. Although Reddit is a big community, what I look for is the small communities. For instance, there’s a specific SUP community here. And what I noticed, is the Vilano brand coming up trumps on multiple occasions when people were asking for advice on the best beginner SUP. Next, I dig through forums and general online reviews. Remember, this is a cheap SUP in comparison to the premium setups, so you want to look for the good and the bad. What I found, was the Vilano Journey SUP had a much better profile overall than any other board in this price range. Then I started looking at what else I can get for my money. With the Vilano SUP, we’re looking somewhere in the region of $300. So, any product in the $280-320 range is going to be a nice comparison. 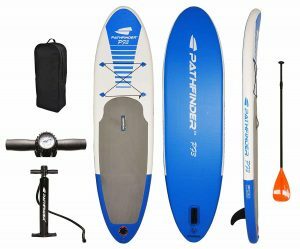 The most obvious competitor is the Pathfinder paddle board kit. It’s similar in price and has reasonable online reviews. There’s little in it, given both boards are the same length, thickness and the kits include the same items. The design of the Vilano gives me a feel of the BIC surfboard I purchased as a surfing beginner, and by this point, I’d already been persuaded by the positive reviews on Reddit and SUP forums – leaning towards Vilano. When you’re new to a sport, it’s hard to know what are the best brands. 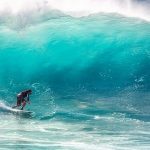 It’s something to be wary of if you’re looking for the best inflatable SUP, as some of these brands don’t seem to even exist, which I find off-putting. Search for Vilano, and you’re presented with a brand website selling bicycles and SUPs – no drama there then. However, when I searched for Pathfinder, I couldn’t find a brand website; that’s a deal breaker for me. If I’m forking out well over $250 for something, I want to know the brand is serious about the products it’s selling. If you’ve researched the Pathfinder board, you’ll see there’s no warranty information on offer. Again, a little worrying. However, jump over to the Vilano Journey paddle board kit and you’ll see there’s a 1-year manufacturer’s warranty. For any outdoor/sports product, I’d consider 12 months to be more reasonable. After all, they don’t know the abuse we’ll give their products over the next year. All of the above sealed the deal for me. Vilano SUP it is! So, let’s talk a little more about what the Vilano SUP kit contains. The great thing about beginner SUPs like the Vilano Journey is they can be used by all the family. The paddle can be adjusted from 65.6”-85”, so everyone can have a go. The board weight on the Vilano is 23lbs, and that’s pretty much standard for cheap paddle boards. It’s no wonder more and more people are switching to cheap inflatable SUPs, rather than the fiberglass alternatives that cost a tonne more; the weight capacity is pretty-much the same. With the Vilano, it’s got a maximum weight capacity of 240lbs – exactly the same as the Pathfinder we’ve mentioned above. So, for those of average weigh, you’ll be able to carry yourself and a bit of luggage (for fishing, or even camping). Transporting this cheap SUP isn’t exactly difficult. Once it’s back in it’s carry case, you’ll only be looking a packed size of 1ft x 35”. Small and lightweight enough for even the kids to carry. Most people worry that when they buy a cheap inflatable SUP like the Vilano, they’ll be losing out in comparison to the fiberglass equivalent. SUP brands have improved the construction of their boards dramatically over the last few years. If you’ve been trying to find the best cheap SUP and have been investigating other brands, you’ll tend to find that the board sizing is pretty-standard across all brands. The Vilano is 5” thick, 30” wide and 9ft 9” long. That’s slightly bigger than what you’d get on a beginner surfboard. You don’t need the agility of a surfboard, so it’s all about stability. As a beginner, this is going to be a huge plus. Getting your centre of gravity on-point (especially in choppy conditions) whilst paddling takes a bit of getting used to, and this extra surface area is going to help. But, it’s also going to help if you have (or suddenly get) uneven weight distribution across the board. You like to SUP with a small child on board, and they’re just doing, well, what kids do! When Will You Need To Upgrade From the Vilano SUP? Stand up paddle boarding isn’t like surfing. The skill gap isn’t as big. Once you’ve mastered the technique of paddling, combined with weight transfer and distribution; you’re good to go. Given the skill gap is much smaller, it also means an upgrade in the near future isn’t crucial. And, that’s good news for your bank balance. Basically, with a cheap inflatable SUP like the Journey, you’ll be good to go for the next few years. You can check out all our latest SUP content by bookmarking our outdoors page and popping back soon. And don’t forget to jump on our email list, and we’ll drop you a line when we post up something interesting. Grant's a motorcycle geek, outdoor enthusiast & confirmed racing nut. He road tests all the gear he buys, and then gives his feedback here on NoobNorm. He also details any quick fixes he stumbles upon, whether that's to stop brakes on motorcycles sticking, or unusual noises coming from gaming wheels.